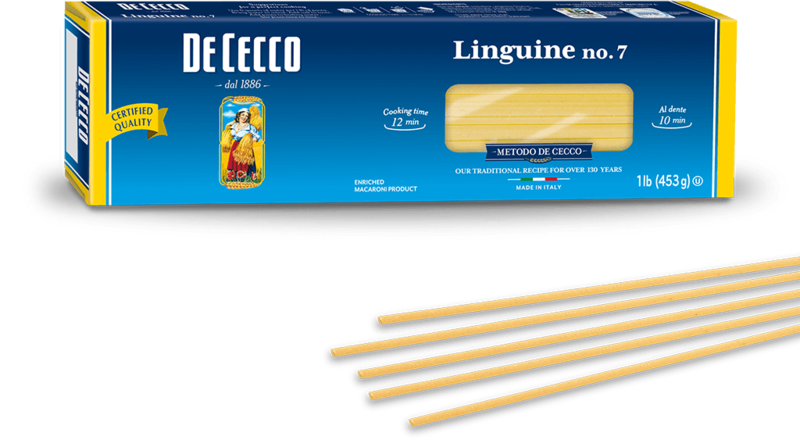 Linguine are the most well-known type of long pasta from Liguria: they resemble a small, flat, narrow tagliatella-type pasta and were created to be eaten with traditional pesto. It is precisely the flattened section and slightly convex shape of this pasta that makes it perfect for trapping the sauce and bringing out all the different flavours. It is excellent just with butter and sage, or combined with fresh tomato based sauces, with vegetables and aromatic herbs, or quick, spicy sauces prepared with extra virgin olive oil, garlic, red pepper, anchovies and capers. It is also ideal with sauces made with shellfish and seafood and with "white" sauces prepared with cream, mascarpone, soft or melting cheeses with the addition of spices such as saffron, horseradish, curry and ginger.